Kasey Killam is the recipient of the 2015 McEuen Scholarship. Kasey is finishing her final year of high school at Petitcodiac Regional School in Petitcodiac, New Brunswick. She lives in the nearby community of Havelock with her parents and younger sister. Kasey has several significant achievements including a first place essay in the 2013 Northrup Frye Provincial Writing Contest, first place crystal (copper II sulfate) in the 2014-2015 Provincial Crystal Growing Contest organized by the Chemical Institute of Canada, and Highest Academic Achievement for her grade level in 2012, 2013, and 2014. Kasey is also a certified lifeguard, is fluent in French, and enjoys volunteering with her youth group. Some of Kasey’s other hobbies include skiing, reading, travelling, and playing soccer, a sport in which her high school team holds three consecutive provincial titles. Kasey says she is excited to attend the University of St Andrews and thanks her family, friends, and teachers for their overwhelming support and guidance. Following her undergraduate studies in Medicinal Chemistry, Kasey plans on continuing her education at the graduate level. Kasey hopes to someday work in pharmaceutical research helping to find treatments and cures for the many diseases facing our society today. We received the following note from Kasey. Here’s a story about the recipient of the 2014 McEuen Scholarship, Jacob Zayshley. Congratulations go out to Jacob Zayshley, whose family could not be more proud. “Ten years ago, while battling cancer, we could not have fathomed the heights you were to reach,” said his family: father Randy, mother Erin, sister Versailles and grandmother Iris Shewchuk. Zayshley is a proud graduate of Vernon secondary school. He was honoured to address his graduating class in June as valedictorian and was recently awarded the Governor General’s Academic Medal, for outstanding academic excellence. Zorbey Turkalp (2010 McEuen Scholar) gave a TEDx talk in June 2014 into the question of whether classical music, with its complexity and richness, help abate the onset of dementia. Watch the talk. Alberta dancer gets prestigious scholarship in U.K.
Here’s a story about the 2013 recipient of the McEuen Scholarship, Julia Sawatzky. A student at the school of Alberta Ballet is “spinning” after receiving a huge scholarship to a prestigious school in the U.K. — but it’s not for dancing. 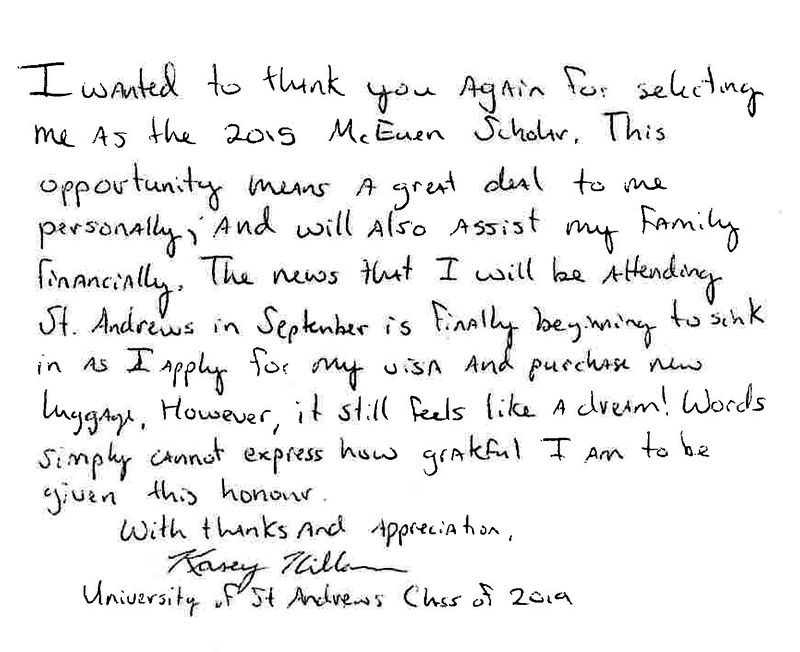 Julia Sawatzky is the first Albertan to receive the McEuen Scholarship at the University of St. Andrews in Scotland, which has only been given to one Canadian a year since 1974. 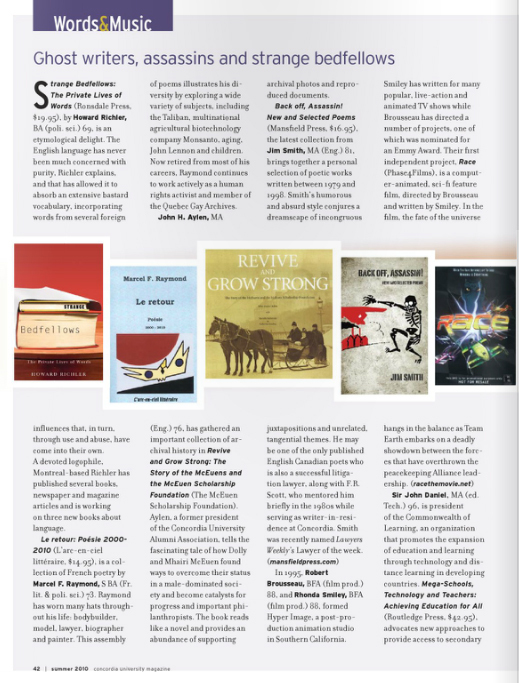 Revive and Grow strong was mentioned in the summer 2012 edition of the Concordia University Magazine. The book is available at Amazon. Here’s a story about the 2012 recipient of the McEuen Scholarship, Emma Archibald. Possibly no dad in Nova Scotia is more excited about visiting his daughter at university than Al Archibald. Emma Archibald, a graduating student at Charles P. Allen High School in Bedford, has won the McEuen Foundation scholarship and will now attend the University of St.Andrews in Scotland, the school where Kate Middleton and Prince William met while undergraduates. The scholarship, worth $200,000 over four years, covers tuition and accommodations. St. Andrews will celebrate its 600th anniversary next year, and even more relevant to Emma’s father, a fanatical golfer, it is just down the road from the Old Course, the most famous golf course in the world. Here’s a story about the 2009 recipient of the McEuen Scholarship. CENTRETON — Some kids choose the university they want at a relatively young age, and focus their energies on getting there. Kids, for example, like Centreton resident Brendan Macdonald. Some kids decide they want to attend their parents’ alma mater. Some kids get complete four-year scholarships to those universities. Yes, Brendan Macdonald. The Cobourg District Collegiate Institute East International Baccalaureate program graduate has won the prestigious McEuen Scholarship to the University of St. Andrew’s in Fife, Scotland.